We know you want the best veterinary care for your pets right here in Knox County! The doctors and staff of Vincennes Veterinary Clinic are looking forward to meeting you and your pets. When your puppy or kitten is not feeling well, give us a call and we'll take care of them like they were one of ours. We are conveniently located in Vincennes, Indiana and serve the surrounding communities in Southwest Indiana and Southeast Illinois. Dr. Sue Hermes, Dr. Andrea Schroeder, Dr. Amy Tiek and Dr. Melody Candler-Catt love animals of all kinds. We know that some pets get a little nervous when they have to visit the vet but we do everything we can to make it a happy experience. We gladly see dogs, cats, pocket pets, birds, and even an unusual critter or two. Our in-house laboratory and digital X-ray capabilities help us make a prompt and accurate diagnosis when your pet is feeling under the weather. Beyond first rate pet care, our clinic is comfortable and pleasant, with separate entrances and seating areas for dogs and cats. For those who need care for their pets while they are away from home, we also have boarding services. Our website has links to help you care for your pets. If you have questions, call us at (812) 882-6677 or email us and we'll promptly get back to you. 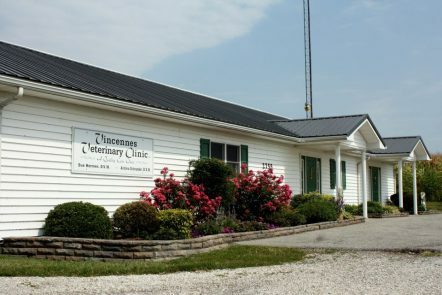 Vincennes Veterinary Clinic is conveniently located and you can get directions on our Contact Us page. We look forward to seeing you soon at Vincennes Veterinary Clinic!